The season of predictions is upon us! 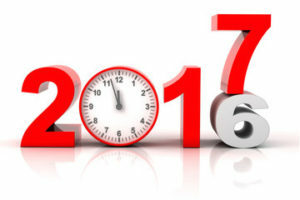 Along with preparations for the Christmas Holiday and the formulation of New Year's resolutions, investors will be bombarded with forecasts for 2017 and various pronouncements by Wall Street pundits regarding the top stocks to own next year and precise prophesies about commodity prices, currency exchange rates, and the granddaddy of them all – interest rates. Of course it is perfectly normal to ponder what lies ahead. This is especially true when so many voices are commenting on how best to position portfolios in light of the risks and opportunities they foresee. On top of the annual cycle of predictions we also have the additional element of the presidential cycle. On January 20th our nation inaugurates Donald Trump as our 45th president. Can a real estate developer, who is also the star of a reality TV show, keep his campaign promises and actually make America great again? Can he drain the swamp? We’ll soon find out. And on top of that we have a Federal Reserve signaling readiness to raise short-term interest rates. All in all, the scenario is ideal for those who want to inform us of all they discern as they analyze the data pouring from their proprietary computer algorithms and gaze into the mists and vapors whirling inside their trusty crystal balls. What’s an investor to do with all these predictions for the New Year? My suggestion is that these forecasts should be read, but mostly ignored in terms of making significant changes in one's long-term investment strategy. The reason to read the forecasts is to gain an understanding of what the market is already pricing in for 2017. For example, if most market participants are expecting two rate hikes, then those two hikes will be mostly priced in before the Fed actually announces the rate increases. If Trump's plan to reduce corporate tax rates is enacted more or less as advertised, then the benefits to the economy and to stock prices will be reflected in the financial markets long before the legislation is signed. In short, any and all credible forecasts will be incorporated in securities prices as soon as they begin to percolate in the minds of the soothsayers. By the time a member of the investing public reads or hears a financial guru's ideas, the information is no longer actionable. It has already been incorporated in stock and bond prices instantly and completely. So if most investors should not act on all these thoughtful predictions, what should they do? The answer is to be reminded that the majority of these forecasts will be mostly incorrect. Stock and bond prices will gyrate in 2017 as the market copes with all the unexpected events no one saw coming. The 2017 that really matters is not the year we imagine a priori, it is the year as it actually unfolds. The market will spend all of 2017 recalculating prices as one after one the most famous forecasts are proven faulty and inadequate. The key is to have an investment approach that is honest, prudent and reasonable given our inability to forecast what the future will bring. 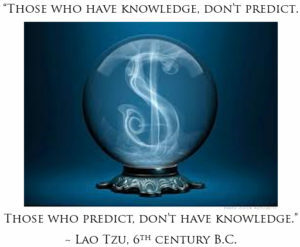 Diversification and a focus on long-term compounding of returns will always trump guesswork, hunches and clairvoyance. So yes, read the forecasts. But then make sure to remind yourself that no one knows exactly what is going to happen next year. No one. With this truth at the front of your mind you will be able to view all the grand prognostications for 2017 with the healthy skepticism they deserve. I agree with Bill Bernstein who has suggested: "Say to yourself every day, "I cannot predict the future, therefore I diversify." Written by Thomas E. Cartee, Jr.
View all posts by: Thomas E. Cartee, Jr.